Yes, back to the NYSDEC’s excellent Five Rivers Environmental Education Center preserve yet again, but this is something I anticipate writing frequently in this blog now that we are living once more in the Hudson Valley! For me, one of the most enjoyable aspects of spring is seeing the reappearance of odonates (a.k.a. 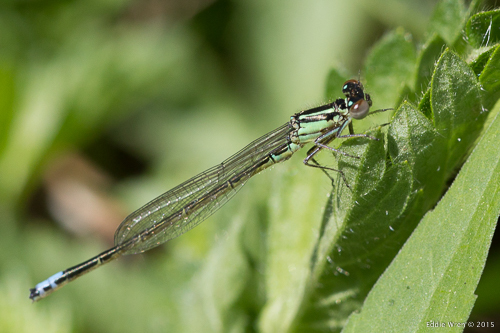 ‘odes’)– the dragonflies and damselflies – and even though they are only just getting started, today’s short hike (May 14) was no disappointment. Because dragonflies are predators and are more robust than – say – butterflies, they tend to have less human admirers, but that’s a pity because they really are remarkable and often spectacular. 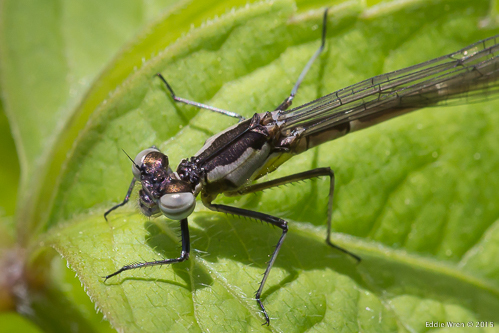 Damselflies are predators too, but are typically much smaller and more delicate. 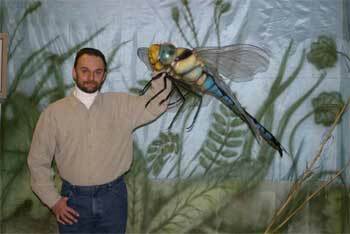 They are also very ancient creatures and fossils of very large dragonfly ancestors are found from 325 million years ago. 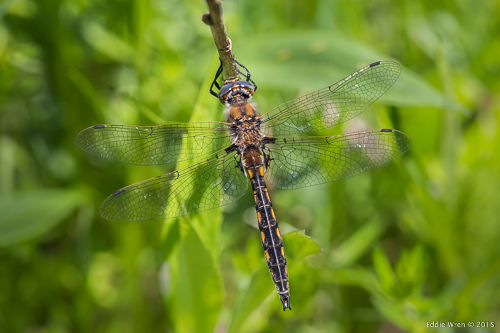 Indeed, in those days, due to there being more oxygen in the atmosphere, dragonflies used to grow much bigger, with wingspans up to 750mm / 30 inches across. One of the challenges with getting interested in odonates is that some of them are very difficult to tell apart. Recognition of various species can literally require catching them and taking a very close look with a hand lens. The good thing is that they can be caught and handled then safely released with no harm done, but in my case I have more than enough to carry in the form of camera gear without adding a long-handled net to the burden, so I will apologise now for not always being able to give a definitive identification for all of my ‘ode’ photographs. Apart from the positioning of the eyes (see the above photo caption) another good way to tell dragonflies from damselflies is how they hold their wings when they are not flying. 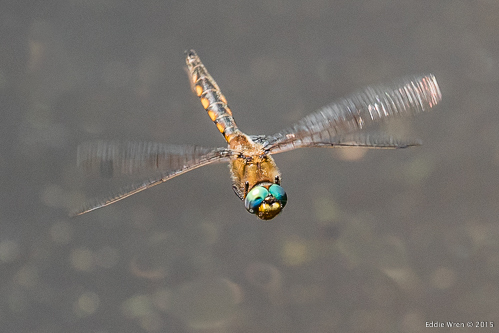 If you look at the top photo on this page, of a dragonfly, you can see that it rests with its wings straight out at right-angles to the body. Now look at the damselfly photos, above and below this paragraph and you can see that their wings are held along the body, not sticking out to the sides. One thing they do all have in common is a need for water for the reproductive phase of their lives, so any water (other than the sea) can be a good location to see ‘odes’, whether it is a large pond, a small pond, a fast stream, a slow stream or even a tiny ‘seep’. If you decide to try photographing them, be aware that they have huge eyes for a reason. They have near-360-degree vision and because many birds will eat them they react instantly to fast movement, so approach very, very slowly. Some species are easier to photograph, though, because they will habitually come back to the same twig or blade of grass as a perch, so watch where they land then move closer – at which point they will probably fly away – then move closer again and keep your fingers crossed that they do come back to the same place. Patience will pay dividends! Dragonflies Through Binoculars, by Sidney W. Dunkle; Oxford University Press. 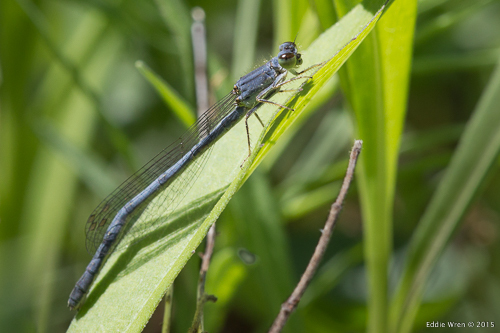 This entry was posted in Capital District, Creeks or Streams, Damselflies (Zygoptera), Dragonflies (Anisoptera), Eddie Wren - articles by, Insects, Links to Websites, NY State, NYSDEC, Odonata, Photography - Wildlife & Nature, Ponds or Lakes, USA (preserves), Water Bodies and Wetlands and tagged Damselflies, Dragonflies, Five Rivers Preserve NY, insects, nature photography, New York State, NYSDEC, Odonates, USA, wildlife photography.